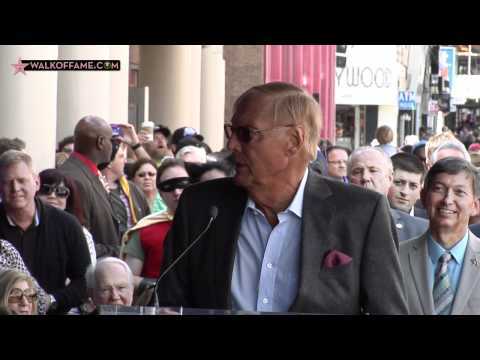 The Hollywood Chamber of Commerce honored Adam West with a star on the Hollywood Walk of Fame on Thursday, April 5, 2012 at 11:30 a.m. “We are thrilled to honor Adam with this prestigious award. Fans have been waiting for this special day for many years. Adam West fired up the billion dollar Batman franchise: the golden years and the classic Batman, the Bright Knight. He deserves his place of honor on our famed Walk of Fame,” said Leron Gubler, Hollywood Chamber of Commerce President and CEO. During the span of a 50-year career, from Batman to the voice of Quahog’s Mayor on Family Guy, Adam West has become a television icon. Born in Walla Walla, Washington as William West Anderson , Adam began his career as a radio DJ and TV show host. He arrived in Hollywood in 1959, after landing a contract with Warner Brothers studios. That same year, he made his feature film debut opposite Paul Newman in The Young Philadelphians. A long line of TV roles followed on shows like Maverick, Bonanza and The Outer Limits, as well as a co-starring role for a season on The Detectives. But, in 1965, his life would change forever when producer William Dozier, impressed by Adam’s talent, looks and humor, handpicked him to take on the title role of ABC’s new TV series, BATMAN. It’s been said the biggest pop-culture phenomena of the 1960’s can be boiled down to the “Three B’s”: Beatles, Bond, and BATMAN. In the early 1960’s, Batman was simply a cartoon character in a comic book that was close to cancellation, but Adam West’s performance in the ground-breaking TV adaptation propelled Batman into becoming one of the most-famous characters in modern fiction. West’s turn as the “classic” Batman has laid the foundation for the success of all the incarnations of the “Caped Crusader” that have followed after him. The smash success of the TV series, and the feature film that followed shortly thereafter, launched Adam West into international superstardom in 1966. After its original run, BATMAN entered into non-stop syndication and Adam West has continued to garner new generations of fans all over the world for the past 40 years. All the while, he’s continued to work on stage, in movies and TV, and as a much sought-after voice actor. It’s his wildly successful career as a voice actor that has brought him his most recent triumph as “Mayor Adam West” on the hugely popular, and critically-acclaimed, TV series Family Guy on the Fox network. Family Guy airs on Sunday evenings on FOX and fans can enjoy more from Family Guy with never-before-seen footage and extras when Volume 10 releases on DVD this Fall. Also this spring, fans can interact with Mr. West as he reprises his role as Family Guy’s Mayor Adam West, but this time in a virtual format in Twentieth Century Fox’s upcoming Family Guy Online game (http://www.familyguyonline.com). For the past 50 years, Adam West has not only been an international television star, but also a devoted father and husband, philanthropist, and dedicated ambassador of goodwill for the entertainment industry as he greets hundreds of thousands of his fans during personal appearances all over the globe. *Special Note: Adam West has a Guinness World Record! “Adam West has made 156 individual screen appearances as Batman, including 120 episodes of the 1966-68 Batman TV series and its accompanying feature film, numerous voiceover performances for animated series and TV movies, and the computer generated video short Batman: New Times’ in 2005.